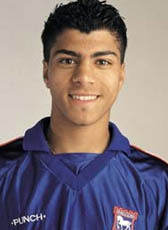 Nabil Abidallah was educated at the Ajax youth academy before making his move abroad in 2000. Playing several seasons in the Reserve teams of Ipswich Town, he went on loan from Ipswich to Northampton Town for the rest of the 2003-2004 season. His 3-year contract expired in June 2004. He has played just two matches for the first team of Ipswich. Abidallah played short-spells non-league football for Heybridge Swifts and Clacton Town in 2004-05 season. Nabil decided to return home after a disappointing period in England. He joined the amateurs of AFC for the 2005-06 season and moved together with his AFC coach to VV Aalsmeer in August 2006. In 2008 is Abidallah for the second time moving abroad. He is trying his luck at Swedish second division club Fässbergs IF during the 2008-09 season. Nabil Abidallah retired from professional football in 2009. After his Swedish adventure he tried his luck at amateur clubs in England at the Swindon Submarines and in Italy at Sardinian club SEF Torres.